Although being given just a 10 per cent chance The 11-month-old girl from Bath, Somerset, battled to survive but will soon undergo an operation to amputate both her arms and legs. The money from the PayPal Giving auction will go towards prosthetic legs and specialist equipment for Harmonie-Rose. 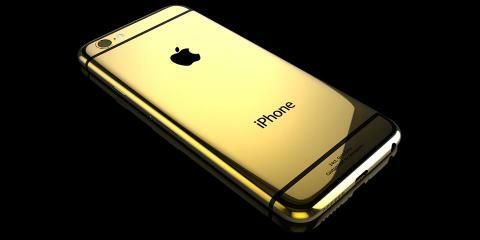 Goldgenie’s iPhone 6 64GB Elite is embellished with a rich layer of 24ct. Gold. and presented in a beautiful cherry oak finish box. Full of technological advancements, including faster processing speeds, longer battery life, improved camera and 1080p HD video shooting capacity, Apple’s new release has made a great leap forward from its predecessors. Thinner and glossier than ever, not only is Apple’s new iPhone beautiful to look at, it is sure to capture your world, your thoughts and your plans more beautifully and seamlessly than ever. And the craftsmen at Goldgenie feel most people would agree that these are worth preserving in Gold. The winning bidder will also be allowed have a personal laser engraving on the back of the phone, making it a unique gift for oneself or a loved one and the ideal way to give something back whilst indulging in the ultimate luxury.